Cheam Windows are Aluminium Bi folding Doors experts and have been installing bi-folding doors in Surrey and London long before they became the lifestyle and high demand product that they are today. Consumers have a wide choice of bi-folding doors to choose from but Cheam Windows choose to provide only one product – perhaps one of the best bi-folding doors on the market today and the only ones with an industry leading 20 year guarantee. 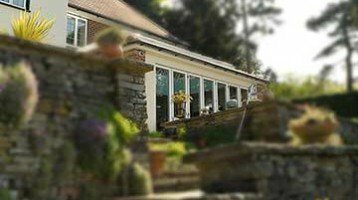 If you are considering bi-folding doors there are a few key things to consider. Bi-folding doors will usually be installed in a new extension or to replace an existing older patio door. Aluminium Bi folding Doors and home renovation. 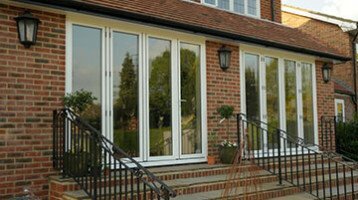 In recent years and despite the economic climate Cheam Windows have seen a massive increase in orders from people extending their homes and needing new windows, French doors and doors. 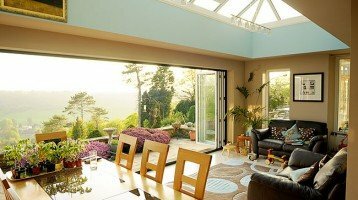 Kitchen and Living room extensions are just one area where people are improving their homes and their living spaces with the addition of bifolding doors that flood areas with light. Despite his increase in home renovation and with folding sliding doors becoming so popular there is now a huge choice of products available. A door is not just a door! Bi-folding doors are unlike typical hinge doors. They are designed, manufactured, installed and used differently to standard French doors or patio doors. Whilst you may be tempted to go for the cheapest product, where bi-folding doors are concerned, cheapest is definitely not the best. Fact. The bi-folding door market has boomed with now a huge choice of door makes and types to choose from. Cheam Windows not only have many years experience in providing the best quality bi-folding doors on the market with an industry leading guarantee, they can also give you expert advice on what to consider. If you are looking for new doors or simply need some honest, impartial and no pressure advice, let Cheam Windows help you as Surrey Installers of bi-folding doors for over 25 years.